Sooo I had to file my nails down to super nubbies. I am--in a haphazard way-- learning how to play guitar! But the really nice thing is that most of my full nail images will fit my nail now to that's a plus. And the guitar is coming along nicely! I hope to be able to play and sing my first song (Wheat Kings by The Tragically Hip) before the end of the month! 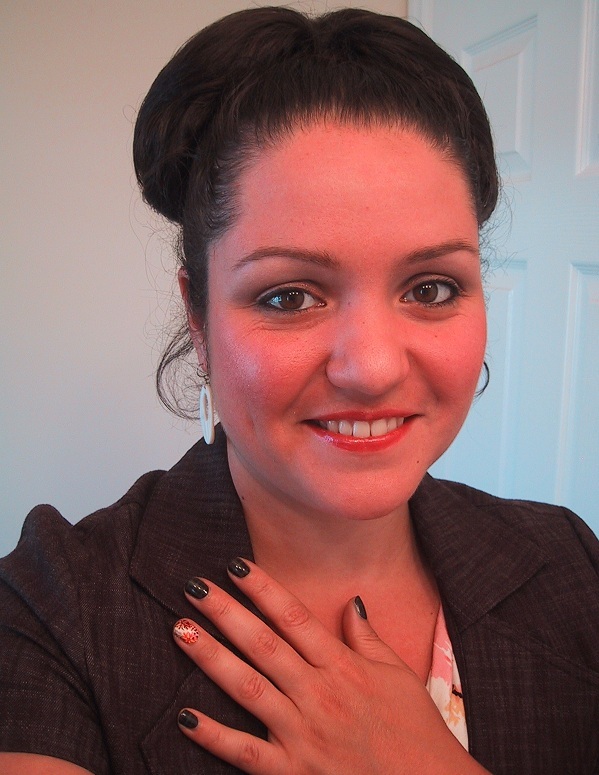 Lately I've been really expanding from just my nails to a bit of make-up and a fancy suit. I got all dressed up the other day and painted my nails to match my new outfit! It's a super cute brown casual skirt and jacket. There is a slight woven look to the fabric that I thought I could mimic with a stamped plaid. Also my accent finger is painted to go with my shirt! BM03 and Konad M60 were used to create this manicure. For all fingers except the ring finger I used 2 coats of Essie Little Brown Dress, and for the plaid, Sally Hansen Complete Salon Manicure Wet Clay. For the ring finger 2 coats of a frankened ivory creme, sponged on a bit of Nina Ultra Pro Like Butta, and Sinful Colors Vacation Time in opposing corners of the nail. 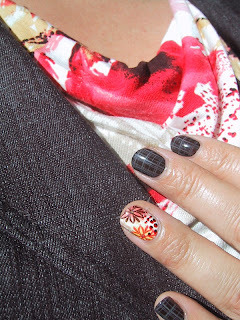 Then stamped the flowers using Essie Little Brown Dress over Vacation Time, and OPI Off With Her Red atop Like Butta. Did a few criss-crossed with Wet Clay, and filled in some areas with tiny dots of Off With Her Red and Little Brown Dress to tie the nail in with my shirt. I wouldn't really consider myself a fashion blogger, but I do enjoy making manicures to match my outfits, and have been dabbling in *gasp* makeup. :P What does everyone think if I do a post here and there to show the complete look? I would love to see the complete look! Your shoes and pedi are fabulous. It really does look awesome! Of course you have to show the complete look! Don't tease us like that! Thanks everyone! :D I will do a complete look next time round! What a great idea! 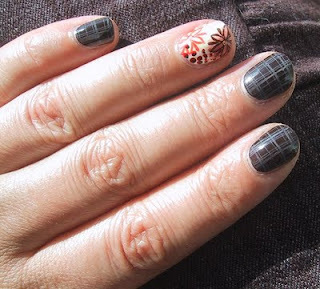 You did a great job stamping your nails...I can never get the plaids to line up correctly. lalala... hehe, I love your red shoes :) also the complete set is wonderful, all tied together makes for wow factor. it is a perfect combo! I love your accent design! Fantastic! I've matched my nails to my outfit a few times but this went way beyond anything I've tried yet. You did a terrific job! Fish Nets, Pink Skullies and a Guest Mani!